Kwong is located in Geylang Road. It is popular amongst locals. 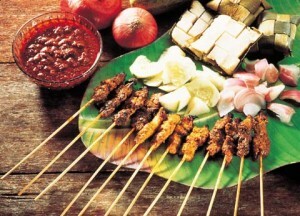 You should try their beef satay, mutton satay, chicken satay, pork belly and pork satay. The price per stick depends on the order. For example a stick of pork belly satay costs S$1, chicken or pork satay costs S$0.40, mutton costs S$0.50 and rice costs S$0.50. They are open from 5pm to 11pm every day except Wednesdays. Haron is located in East Coast Lagoon Food Village. They offer a good satay plus a relaxing place next to the beach. Haron received recognition from The Straits Times as the Singapore Master Hawker. You must try their chicken wings, mutton satay, beef satay and chicken satay. You should pay S$0.60 per stick but the minimum order is 10 sticks. They are open from Tuesday-Friday (2pm to 11pm) and Saturday-Sunday (11am to 12midnight). Chomp Chomp is a Hawker Centre comprised of the best vendors in Singapore. The services are excellent and efficient. You should try their rice cake and partner it with mutton satay, beef satay and chicken satay. Prices range from S$0.45 to S$0.50 per stick. They are open from 6pm until 12pm daily. Chuan Kee is located in Old Airport Road Food Centre. The store is one of the best because of its more than 50 years of experience when it comes to Satay. You should try their chicken, pork and mutton satay. You can also taste their bak gua. The price ranges from S$0.40 to S$0.50 per stick. They are closed every Monday and Thursday.